As an artist, thinker, designer, and creative epic world-builder currently majoring in Illustration and Literary Studies: Writing / Psychology at The New School’s BAFA program (Parsons School of Design and Eugene Lang College of Liberal Arts), my passions and interests have both expanded and stayed largely true to who I am. At heart, I am someone driven by an insatiable curiosity, who is trying to derive meaning and truth from the chaos of our lives and this world we live in, and that has not changed throughout my first year at The New School. My interests in art and design, in the past and now, have always contained elements of science fiction and fantasy, the weird, the bizarre, the surreal, the mythological, the Lovecraftian, Asimovian, Tolkien-esque, Dali-esque, and, overall, the esoteric and the cosmic. I grew up as a child with Star Wars and spaceships, with my interests in traditionally “nerdy” subjects only growing as I grew older. Now, as a college student, I have found myself enamored by poetry and its beauty, with epic, rich worlds of the imagination, with books leading me down a mental rabbit hole to the pits of the human subconscious and the abyssal seabed of reality itself, with the secrets of the universe and what it may hold for us as a human species, and with theories and manifestos evoking lofty, utopian ideals that we may one day fulfill when we reach the farthest stars and worlds beyond our own. Just as I have stayed true to my convictions and passions throughout my first year at the New School, so have I also begun to explore new venues and pathways, and develop new interests in minimalism, in vector-based design, in international relations and global politics, in realistic drawing, in the relationship between math and art in the natural world, in medieval European history and metafiction in cultural ideas and religious or spiritual values expressed through ancient artifacts, in logo and book cover design, animation, and innovative concepts of time, as well as in the publishing industry and its elusive advice on making it as an author. Having taken numerous courses and completed many assignments throughout the time of my first year at both Parsons and Lang, a common thread of similarity that has bound most of my projects and classes together into a tight-knit thematic “web” is something I have taken note of. Just as prevalent, however, are the ways my projects and learning experiences have diverged from one another and explored new, different territories, constructs, ideas, narratives, and perspectives of looking at the world from various pairs of eyes. In my first semester (and even in my second semester), for instance, the discussion and exchange of abstract relationships between two or more seemingly unrelated ideas or concepts united all of my favorite and most impactful classes and permeated the theme of my first year at The New School. In the broadest sense, this exchange of ideas directly has translated over to how my projects have evolved and matured (sometimes taking inspiration from several classes despite being pertinent to only one class in particular), and has influenced what I have learned so far from every class I have attended and how I have incorporated skills and academic lessons from these same classes. To give a more specific example, my Math and Art class in my first semester epitomized the relationship between math and “art”– not merely visual art, but poetry and storytelling as well (especially in regards to Oulipian constraints), which has influenced the flow and methodical style of my fiction and poetry work now, despite the different core focuses. Criss-crossing classes, my first year Don Quixote course, meant for juniors and seniors, analyzed the novel Don Quixote by Cervantes as a metafictional work, as a satire on archetypal fantasy novels with perfect heroes, as a critique on society, as a psychological work, and as a novel reflective of Cervantes’s time period and the medieval backdrop of the Crusades. Don Quixote, as a class, influenced my final project for my Intro Studio 1 class, in which I was tasked with creating a “mind map” of my journey, trials, tribulations, struggles, and experiences in the course. I ended up creating a vast fantasy map inspired by the regional shape of the map of the Village and Time’s Square’s Garment District populated by fantasy creatures that took locations from the real world and placed them in an alternate setting. I had inserted myself as “Don Carolus” and turned everyone in my class into a knight or warrior– making us all a “Round Table” on various “quests”– this being our assignments and projects. In terms of metafiction, the novel also influenced the metafictional aspects of my stories in Intro Fiction that I have submitted thus far– works that break genres and tropes, subvert them, or turn them against themselves. In regards to design and minimalism, one of my final projects for my Drawing and Imaging class was a book cover done on Adobe Illustrator, and, a bit unexpectedly, in terms of visualizing my literary creations, my Intro Studio 2 final project (a science fiction comic strip depicting the final hours of a Red Baron-esque straighter pilot on Titan amidst an interstellar alien war) was directly inspired by a story I wrote for my Intro Fiction class called “The Baron of Mars”. In this way, what I have learned in some classes has directly inspired the execution and application of interesting concepts in visual form in my Studio classes, and sometimes my writing classes, solidifying the main theme of my first year of the exchange and discussion of abstract ideas. Many of my projects and papers were exciting and fascinating in that they engaged me intellectually, forced me to think outside of the box, led me down rabbit holes of research, and gave me creative freedom to imagine and synthesize new ideas, constructs, and sometimes entire worlds. My fantasy map project in particular was exciting for me, as is now my final project for my Intro Studio 2: Visual Culture course– the aforementioned comic strip. Both projects engaged and excited me at the maximum level because they gave me the opportunities to world build, to create myths and lore and synthesize deep, rich histories that added meaning to the overall pieces. In my writing, several of my Objects as History papers, Seminar essays and papers, many of my aforementioned Intro Fiction stories, and on occasion, some of my projects from my Time: Frame class elicited a similar feeling from me of excitation at the prospect of world-building– of researching pre-existing cultures, mythologies, perspectives, ideas, and the like as the base for my creations. The very act of creating yet another universe for my characters and ideas to inhabit filled me throughout this year with joy and happiness. My personal favorite examples include the first short story for my Intro Fiction class that I wrote called “Theseus’s Universal Thesis”, and a poem that I wrote for my Time class in conjunction with a tarot card style poster depicting a collage created out of other collages, resulting in a bizarre cosmic god-figure. 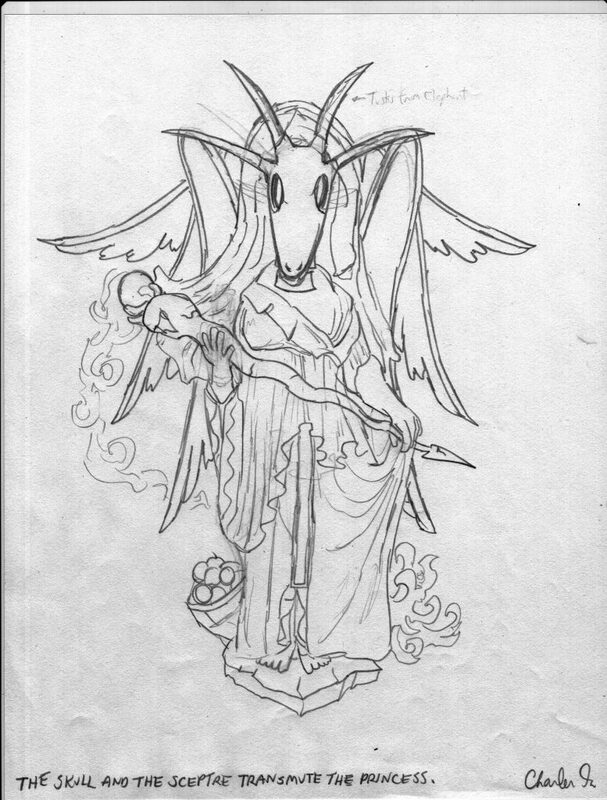 The former is a story involving several deities inspired by the deities of various mythologies and belief systems sitting in a college classroom working on their Final Thesis projects– namely, the creation of a Universe with life on it (extra credit if the life is diverse and manages to advance significantly), and chronicles the plan of one deity to sabotage the Universe of the star student in the class out of revenge. The latter poetically describes a legend or prophecy involving an Eldritch horror destined one day to be released from his star prison of Polaris, and wreak havoc on the Universe before destroying it and recreating it again– only to be imprisoned by Cosmic Lawmakers once more in another star, amidst an endless cycle of creation and destruction. The above project: “Robots, Cherubim, and Cryptography” is a piece I did for my Drawing and Imaging course as a penultimate final piece– and it no doubt embodies the cosmic and the esoteric, as is the common thread that often defines most of my work and my interests in art and design. Because of this, it is a more than suitable work to include as highlight of my first semester. The guidelines for the project, according to my professor, were that I had to create a pattern within a square space or document on Adobe Illustrator, and then duplicate the pattern three more times in order to create a symmetrical uniform pattern that had to communicate some sort of idea, thought process, or aesthetic of mine. More specifically, the final iteration of my symmetrical pattern had to communicate a sort of message or concept through a combination of color, form, typography, and shape– a concept that could be summarized in THREE key words. The project was also supposed to be done in black and white and in different colors (the version above of yellow and gray is only one of four, but is the one I thought looked the best) to demonstrate how a shift in color, contrast, and aesthetic equates to a shift in meaning and to demonstrate the creative process overall. Since the project could be really about anything as long as it could be summarized in three words and communicated effectively, the first idea that popped into being in my head was combining robots and religion, or robots and angels, partially inspired by a project I was working on for my Intro Studio 1 class (before my Fantasy Map project) that involved me experimenting with book covers and writing out an entire story about a species of robots that evolve like humans and war over religion (based on concurrent research for my Intro Seminar 1 class final paper detailing the dangers of AI for modern society), and partially inspired by my own fascination with robots in science fiction, as well as by my own Catholic upbringing. 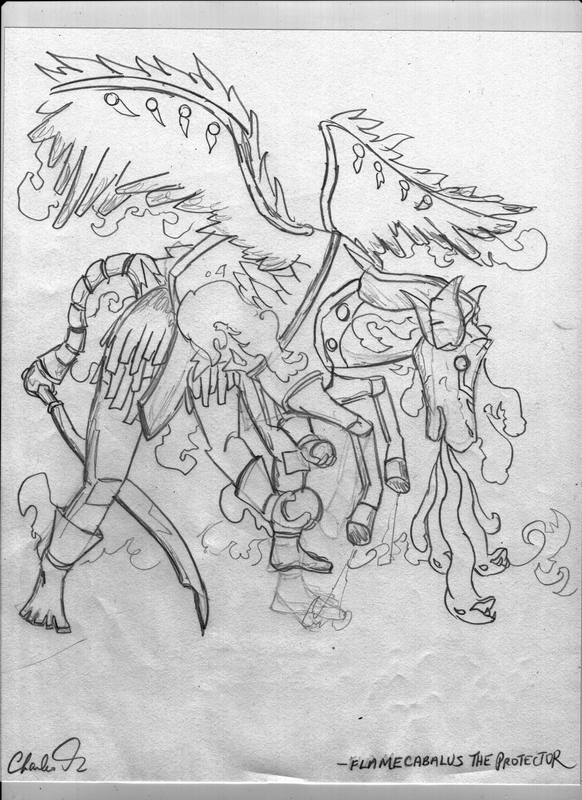 After doing some preliminary sketches of what I wanted my design to look like, and struggling on Illustrator to capture the perfect aesthetic for my design, I had the idea of incorporating cryptography or esoteric semiotics into my design, which eventually resulted in the three keywords I mentioned earlier: “Robots, Cherubim (referring to an order of angels in Catholicism and Christianity), and Cryptography (symbols, hieroglyphs, etc). As time passed, my work became more and more complex and detailed, as I managed to create a pristine, sleek angel design that seemed almost metallic like a robot (with a halo!) surrounded by a complex pattern of lines resembling circuits. I then proceeded to add “hacker speech” and binary code at the edges of my pattern– the cryptography of my piece– that would simulate modern “hieroglyphics” and would to a far future “cyber-archeologist” or “cyber-symbologist” seem like an ancient language begging to be deciphered (in this sense, I merged the past, present, and future– religion with computer science). 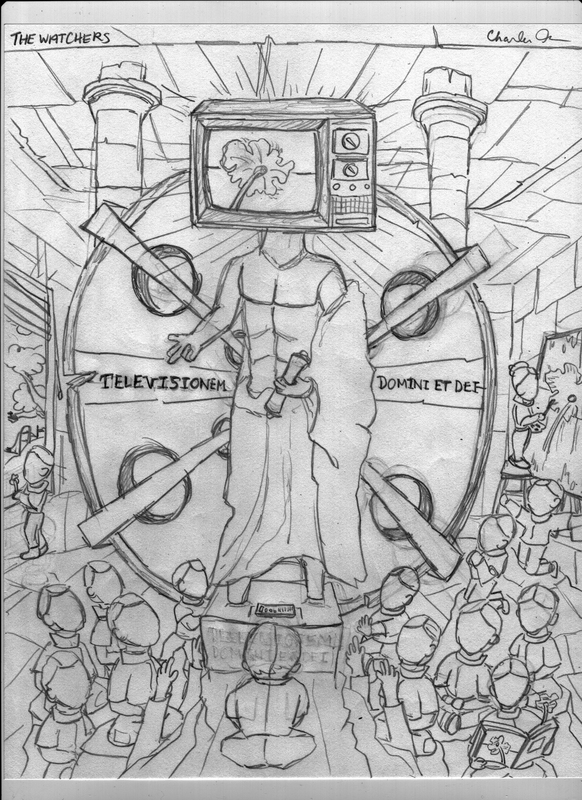 My overall theme of my piece then, after a short while, emerged as the concept of religion as a tool for mind-control of the masses, as something you can program into people’s minds like data or an algorithm– hence, the Christian cross perched atop what looks to be a radio tower, espousing doctrine like a computer espouses data. The term “Deus Ex Machina” — Greek for “God out of the Machine” brought everything together under the umbrella of “techno-religion”– under the merging of the scientific and the religious– under the concept of technology as our way to ascension and, arguably, immortality. If one looks closely around the triangle surrounding the cross and radio tower, one can read “I AM”– referring to God’s name in the Bible when Moses asked him on top of Mount Sinai. Once I copied my pattern design three more times, I found it not only beautiful but also conceptually rich in detail and meaning– and noticed most of my ideas were spontaneous without any real planning involved (besides my sketches). 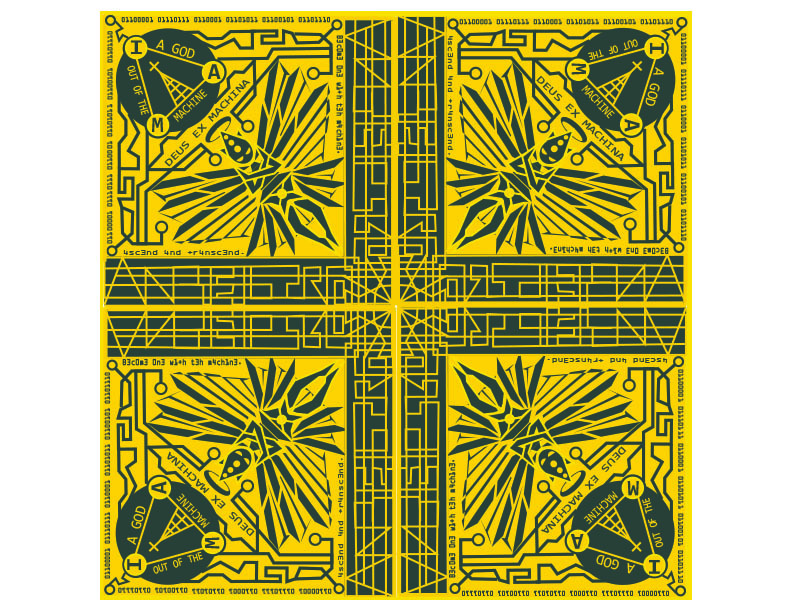 The design copied three more times formed a highly detailed cross streaked with yellow lines throughout, something I intended to do and found majestic. After creating my design (originally gray text and shapes on a yellow background to highlight and contrast the foreground with the background for easy reading), I went on Photoshop and saturated the colors of my design and created a blue and purple version, a red and black “demonic” version, and a strange orange and green version alongside my black and white “lined version”. Having presented my project and having been praised for my intention to detail and meaning in my Drawing class, I can now look back at this project and assert that it represents who I am in a sense, as well as my interests in the esoteric, the futuristic, the philosophical, the quasi religious and mythological, the technological, and the mystical and alien (far removed from our mundane world). I learned through this project how to communicate a message effectively, and how to integrate both text and visual imagery together to create a complex “narrative” that had a certain theme behind it. In general, the aesthetics and complexities of my work in the message about religion being a “program” or algorithm is what made this piece so successful, and in the end, I began to see myself more and more as the type of person who likes telling stories, preferably of the fantastical or imagination-heavy kind. Like my penultimate Drawing and Imaging assignment I just mentioned, the above project: “Dichotomy of Pandualoth” embodies the common thread that permeates my work involving the cosmic and the esoteric, as well as the fantastical, mythological, and science-fictional. It is a highlight of my second semester, and one I especially put much hard work and soul into for my Time: Frame class’s penultimate “Collage Project” (you may remember me mentioning this at the beginning of my reflection). Though the actual process of the “Collage Project” was long and tedious, the results for me were completely worth the effort. I was initially tasked in my first week and second week of the project with taking 20 or so pictures of objects that I suspected or knew were from different times in the past, and sketching them in my sketchbook, and so I did. For my third week, I was tasked with collaging aspects of all 20 of the objects into different individual collages, mixing and matching pieces of each object I took a picture of and drew and creating wholly new “chimeras”, if that makes any sense. I had to do several collages before I could move on the third step of this project during its fourth week: choosing one or more collages that were interesting to me in conception, form, and overall aesthetic. The three hand-drawn collages above: “The Watchers”, “Flamecalabus the Protector”, and “The Skull and Scepter” were some of my favorites out of all the ones I created, and some of the ones I found the most interesting. Looking back, I notice all my favorite collages had this mythical or esoteric and fantastical vibe to them only found between the lines of a fantasy novel or something of the sort, relating to my very much novelistic mind. All of my favorite collages were also mashups of art exhibit pieces, statues, among other things (as an example, The Watchers combined the TV set of Zen for TV— a MoMa piece by Nam June Paik– considered the founder of video art, the statue of a Roman boy in the Metropolitan Museum of Art, and part of a statue found at Parsons featuring a child sitting on top of a man’s head (the faceless children). Following the initial conception of several collages, I eventually arrived at my final “tarot card” collage poster when I drew three more “super-collages” created out of parts of all my previous collages– the final rendition above “Pandualoth” (which I did on Adobe Illustrator and spent several days on), being the one I found most interesting and eventually decided to incorporate into my project. Though I had the idea of “Pandualoth” spontaneously, I was surprised at how it turned out, given how each “arm” of the creature (who I would later transform into a deity of opposites and the harmony between creation and destruction, light and darkness), went in an opposite direction, and how the overall body structure of the collage made it seem like the abstract forms you would find in a Bicycle playing card (king and queen, for example). The tarot card idea I developed for this final collage only added to mysticism surrounding my creation, and thematically relates to, once again, the esoteric and the strange. Alongside the tarot card, I created a poem that explained the mythology of “Pandualoth”, the primordial deity of opposites destined to destroy the Universe (by accident amidst its struggle to defeat itself) and recreate it using the singularity at its center, after its release from an exploding North Star. 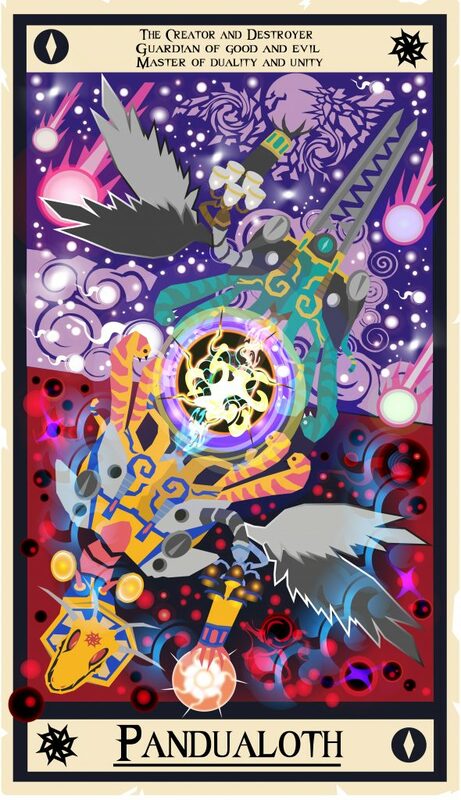 The tarot card’s background and edges embody the top half of Pandualoth, who represents life, creation, and wisdom (symbolized by the eye on the upper-left and lower-right corners of the card), and the bottom half, who represents chaos, destruction, and death (symbolized by the demonic star on the upper-right and lower-left corners of the card). Though both halves are opposite, they are merged and made one and the same by their singularity at the center. Cosmic scenes with comets, stars, black holes, and primordial energy accentuate the theme of my work in the cosmic and the esoteric– things created out of my head and with originality. As was the case with my Drawing assignment, I learned through this piece how to communicate a message visually and with text. I also learned of the uniqueness and power of collaging objects together to arrive at something truly spectacular– something universal. The integration of color and various effects and tools on Illustrator is something I know I executed excellently in my work– especially in the case of the godly Warp tool and Flare tool, which helped me create renditions of stars in my tarot card project and thus add realism to this otherwise fantastical world taking place in the far, far future that I created. Though I have learned much in my first year at The New School, I am well aware that I still have much to learn and have tons to look forward to in the future as I progress through my second, third, fourth, and fifth years at The New School under its BAFA program. For the future, I am mainly interested in continuing my studies in Illustration and in Literary Studies/Writing, but I am also intrigued in pursuing Psychology, Communication Design (in book covers and logos) and Philosophy (I will have a good start in the latter since I will be taking a course solely on Schopenhauer’s World and Will and Representation– a text I will surely love). Question-wise, I am curious about studying science fiction as a genre, and how dystopias and other science fiction constructs have become prophetic and representative of our current times, and what lies in store for us in the future. I am also interested in studying obscure mythologies and how to incorporate them in contemporary, modern settings, or even futuristic settings. This will the gap between the ancient past and the far future and add complexity to the stories I plan to write in the future as an author. It is clear, as I have mentioned numerous times, that ideas from my previous projects can generate other projects, and, as I see it, thinking creatively and laterally, as well as saving parts of projects that may be interesting for future projects, can help bring these same future projects into fruition. As for skills and techniques I wish to learn in the future as I move forward, I am very interested in learning animation and the art of comic book illustration and about some of the finer aspects of poetry and prose, which will improve my poetry and prose overall, as well as read some more obscure “hipster” authors of this current generation, which will allow me to gain new perspectives on life and the world around me. Learning animation techniques will allow my detailed illustrations to develop a life of my own and facilitate a more engaging and active form of storytelling not merely confined to the mind or to the pages of a book. As I stand, my future in writing, design, illustration is bright as long as I persevere towards my goal of getting my stories and narratives out in the world, whether they are expressed through a poem, through a story, through a simple logo/book cover imbued with originality and meaning, or through detailed illustrations, especially if they are in comic book style. In the future, I will no doubt continue digging deep into rabbit holes that might lead me into fantastic worlds of the imagination and continue reaching for the stars and higher planes of thought. It’s who I am, and who I always will be.